In this painting tutorial you will have the opportunity to see how a moody atmospheric landscape is painted in watercolors. This particular watercolor landscape painting demonstration features the mystical charm of Loch Eck in Scotland. �The artist has used 130lb Fabriano watercolor paper measuring 15″ x 11″. The brushes which have been selected are the large Ron Ranson hake, 3/4″ flat and number 3 rigger. The watercolors used in this lesson are from a palette of Cotman watercolors; Raw Sienna, Burnt Umber, Light Red, Ultramarine, Lemon Yellow and Payne’s Gray. 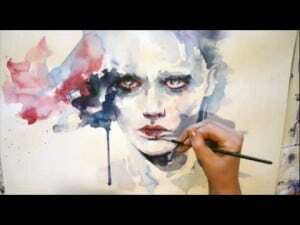 Reach for you brushes and just follow this well narrated video to discover the beauty of watercolors.